When I was a kid, my favorite mug had a frog in it. It wasn’t a real frog that I had stuffed into my mug, but a ceramic frog that sat at the bottom of the mug and was slowly revealed as you drank. Inevitably, I was drinking milk and the frog’s little head poked out when I was about halfway through. I recently found my old mug, tucked away in a box in the garage, and it brought back all those old memories. It also gave me the urge to see if something a little more grown up was out there: there is. 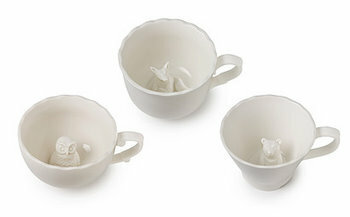 Hidden Animal Mugs are beautiful ceramic cups that have delicate, detailed figurines inside that are revealed as you drink – just as my frog was. The whimsical designs include a fox, an owl and a bear. Their colors match the tone of the cup, so they’re subtle but fun at the same time. The cups, unfortunately, are sold individually so getting aset can be a little expensive. Fortunately, I only need one for myself to bring a little nostalgia to my coffee break.